Includes an engraved-metal title plaque. Limited edition of 1,000 pieces. Stand tall, Kenobi! As seen in the animated micro-series Star Wars: Clone Wars, this fine-art sericel features General Obi-Wan Kenobi with a squad of ARC Troopers. 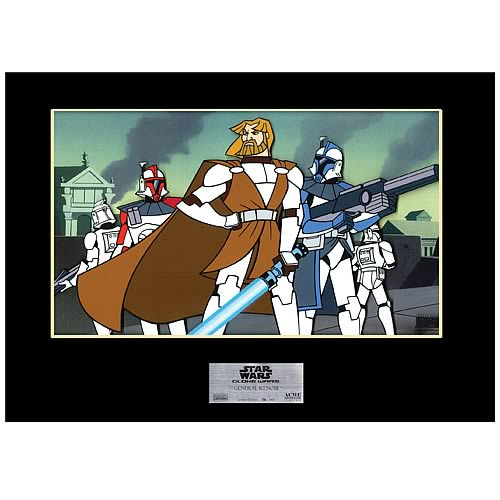 A distinctive work taken directly from the original production model sheets and character designs, it measures 10-inches tall x 12-inches wide and is hand numbered with an engraved-metal title plaque and official Lucasfilm certificate of authenticity. This is a limited edition of 1,000 pieces worldwide that arrives in an officially approved frame. You'll be the one standing tall with this on your wall for all to see!